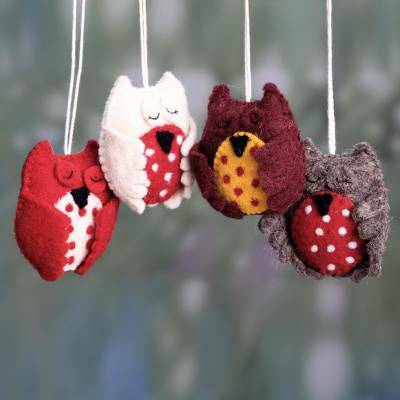 Wool Felt Owl Holiday Ornaments Handmade in India (set of 4), "Sleepy Owls"
Four sleepy owls doze through the holidays; are they dreaming of sugarplums? Rajesh Gehlot in India presents the set of four ornaments, crafted by hand of wool felt. The ornaments feature cords for hanging in arrive in a sheer polyester storage bag.